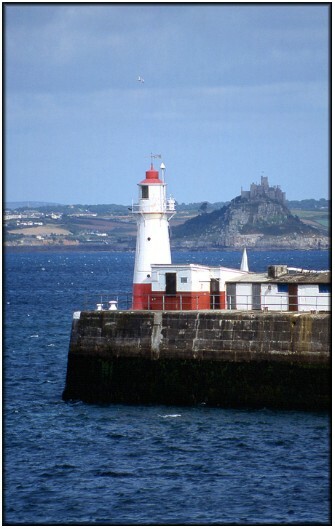 Not far from Penzance is the important fishing harbour of Newlyn which is also graced by an impressive harbour light. The South Pier at Newlyn was originally constructed in 1884 and the first lighthouse was built at the same time as the pier. However, in 1914, the pier was extended by 100 feet and the original lighthouse was demolished and replaced with the one shown in the photo. In the background to this photo can be seen Mounts Bay and the prominent landmark, St Michael's Mount. The small, colour coordinated building at the lower right of the lighthouse houses the Ordnance Survey datum equipment - the Ordnance Survey calculates all altitudes in the UK relative to the mean sea level at Newlyn. There is no public access to the pier but there are a number of other locations from which shots of the lighthouse can be obtained, in particular the end of the Victoria Pier on the north side of the harbour entrance. From that viewpoint the light is likely to be more favourable in the early morning or late afternoon.